Training tomatoes for increased production and management. Staking tomatoes after planting is very important whether the plant is grown indoors or outdoors. It will make the plant grow healthier and get sufficient amount of sunlight. Supported culture systems are very relevant in organic tomato cultivation for many reasons. It helps to reduce disease problems and fruit rotting, whether in field production or high tunnels. Though training tomatoes can be labor and capital intensive but it offers significant benefits. It helps to improve air circulation as well as reduce the plant’s contact with the soil. 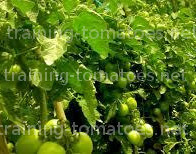 In humid climates, for instance, training tomatoes is very important for proper air circulation. This is because tomatoes grown in these regions are highly susceptible to diseases and they need proper air circulation to do well. This system of training tomatoes is also very important in organic tomato production systems due to the limitation in the supply of effective organic control products, especially when a problem occurs. There are different ways of training tomatoes and all are effective. One can decide staking tomatoes with strings, trellises or make use of surface mulch. It is important to decide which method to use before planting. The reason is because the training or mulching system chosen will impact the field design as well as the plant spacing. Staking tomatoes after planting will improve the quality of fruit by improving air flow and keeping the fruit off the soil. A well-structured tomatoes training system will also make the fruit easier to harvest. Since staking tomatoes with strings requires some investment in material and labor, the benefits of these cost has to be increased. On the other hand, tomatoes grown unsupported require fewer hands to manage but are highly susceptible to diseases, especially when grown on bare ground. String trellis tomatoes perform well because the supported system provides a physical structure for the plant to grow and bear fruits. Staking tomatoes with strings are usually done 2 to 3 weeks after transplanting and it can also be done when the plants get to a height of 12 to 15 inches. 1. Once the plants start sprouting get your stakes, ties and hammer ready to stake your tomatoes. Do not allow your tomatoes to grow too tall before you stake as this can make it difficult for you to stake. It can also damage their roots or stalk when you start staking. However, you can stake when the plant is between 12 – 15 inches tall. 2. Choose a spot to stake your tomatoes. It should be within the range of 3 – 6 inches away from each plant. 3. The next thing is to insert the stake into the ground and pound it with a hammer or any object that can do it properly. Stakes should be firm so they don’t fall off after some time or even after a heavy wind. 4. If the tomatoes have already started producing blooms, then you can start tying them to the stake. Tie the main stalk to the stake. The tie should be wrapped around the tomatoes and the stake loosely, then secure it with a knot. 5. As the branches begin to grow, you can tie them to the stake. Also, tie new growth from the plants’ main stalks with longer ties to give more room to wrap them around the stakes and branches. 6. After staking, you can visit your farm every day to see if new growths are coming up. Ensure that you tie the new growths as you did for the others before they touch the ground. It is also important to remember that the growing stems are usually soft and can be damaged easily, so tie them loosely.